I'll admit, sometimes I get caught up in a world of complaining. It's hot. I'm tired. I feel like hubby works too much during football season. I'm hungry. Our house is a mess. The kids are a handful. Etc. 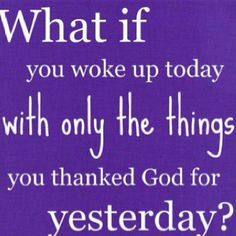 What if I could channel all of the energy I'm using in my complaints, and use it to be thankful? I love this quote from Pinterest. Today, I'm going to share some of the things I am most thankful for. This is obviously not everything, but the start of what I hope to do more often. 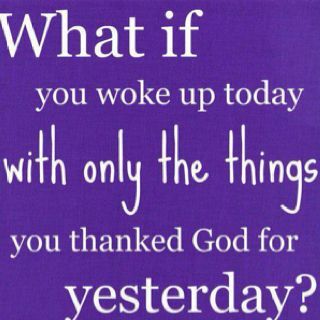 Making a conscious choice NOT to complain, but instead be thankful. It's the perfect season for me to put this into practice, and I hope you can try it to. I see people's thankful posts on Facebook and it makes me happy. I'm guilty of using social media to vent, because somehow it just feels better to know we aren't alone in our struggles. However, there is something contagious about being happy and thankful. Positive people create a feeling of joy and gratitude. I'm going to have an attitude of gratitude. Or at least as much as I can! Some of these are really meaningful and others are silly. Rejoice in all things good...big and small! 1. My family. I never imagined having the family that I do--one amazingly supportive husband and four beautiful children. I can't tell you how many times we get stopped by people who say, "2 boys and 2 girls? How lucky!". I usually smile and answer, "thanks!" as we walk by. However, when I pause and think about it...dang! I hit the lottery. I am so thankful that God chose me for Adam and for my kids. Brothers and sisters. Two of each. God knows what is perfect for each family and I am incredibly thankful that he knew just what we needed. Despite the chaos and the craziness, I am humbled. 3. Sunshine. We've had one of the most beautiful summers I can ever remember. Sunshine, heat, and clear skies have been the theme of our summer and I am so thankful for that. Living in WA makes sunshine that much more special. We don't take it for granted and truly appreciate every day with the sun. Furthermore, I love seasons. Because of our beautiful summer, I'm looking forward to fall, cooler temps and a change in seasons. Funny how that works! And just as fall is ending, I love cozying up for a cold, snowy winter. I think the only season I don't love, love, love is spring. We get a lot of rain in the spring and although it means getting closer to summer, the transition to fall is my favorite. 4. Technology. I have a love/hate relationship with technology, but for the most part, it's allowed connections like we've never seen before. Specifically through social media. I know there are people who badmouth Facebook, Instagram, Twitter, etc, but I can honestly say that it has helped me to keep in touch with hundreds (yes, literally) of people that I otherwise wouldn't. It makes it easy to see a friend after 15 years and pick up exactly where you left off. Or when relatives across the country can keep up on pictures and happenings because seeing them in-person is not reality. I'm so thankful for technology and as many times as it has ticked me off, it's an amazing tool of communication. 5. Our house. Adam and I bought our house 6 years ago after a looooong, long search. I remember when we were first married and would go on runs into this neighborhood to daydream about living here. We never thought it would be a reality. Way out of our league. And then, the market took a nose dive, the house we were living in sold faster and for more than we thought it would, and this house came on the market as a short sale, making it more in our price range. The stars aligned, and we finally moved in, after 8 months of negotiations with the bank. We still pinch ourselves that we live here. Is it new construction with the latest and greatest upgrades, fixtures, floorplans, etc.? Nope. But, we wouldn't trade our yard, our neighborhood, or our neighbors, for anything. It really is perfect for us and I am so thankful to make our home here. The most important part is that our kids are happy. We recently asked them what they would think about moving (just hypothetically) and the immediate answer was tears. No way. At that moment, I knew that we are right where we belong. These are just a handful of things I'm grateful for, but it was a fun exercise for me. I'm challenging you to change your attitude as well. There are people in this world who would give anything to live your life, grateful for the things that you complain about. Let's practice an attitude of gratitude. What are you thankful for today? Have you told them? Do it!! I'll be continuing this post with more things I'm grateful for.